Singapores Prime Minister Lee Hsien Loong handed over the presidency of the Association of Southeast Asian Nations (Asean) to his Thai counterpart Prayut Chan-ocha at the conclusion of an annual summit on Thursday. Lee handed a baton to Prayut to symbolize the handover of the rotating Asean presidency during the summit's closing ceremony, Efe news reported. In accepting the 2019 presidency, the retired Royal Thai Army general officer said his country would prioritize the bloc's stability, development and economic growth through "trust, respect and mutual benefit". Among the challenges the bloc faces will be concluding negotiations on a free trade agreement with Australia, China, South Korea, India, Japan, and New Zealand, known as the Regional Comprehensive Economic Partnership (RCEP). 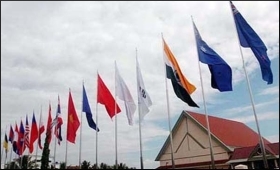 The RCEP, a free trade pact being negotiated since 2012, which is expected to be finalized by 2019, seeks to bring almost half of the world's population, 40 per cent of world trade and more than a third of global GDP under the umbrella of a single trade zone. The first draft of the newly-proposed South China Sea code of conduct will also be discussed during Thailand's Asean presidency, an agreement which aims to reduce tensions arising from territorial disputes in the South China Sea. Brunei, China, the Philippines, Malaysia, and Vietnam have competing territorial claims to islands in the South China Sea.